Andres Bonifacio, Jose Rizal, Apolinario Mabini and other revolutionary and nationalist heroes have remained relevant in our homeland because the socioeconomic conditions that existed then practically exist till now, if not worse. Fast forward to post-WW2: with the wave of strong nationalism in the former colonies, capitalist colonialism was replaced by neocolonialism [more recently aka neoliberalism or globalized free trade]. Before we had foreign administration and foreign troops watching us in our country; today we have pro-foreign, native administration and pro-foreign, native troops doing the same. In similar vein, despite the fact that communism in practice has collapsed worldwide except for a handful of Third World countries (less than our ten fingers), communism in our homeland has remained relevant simply because the harsh socioeconomic-political conditions (system) that perpetuate impoverishment of the many -- which this ideology dissects and correctly condemns, and that motivates its armed and unarmed followers fight against-- still exist. Thanks to Reagan and Thatcher for their policies of minimal government and corporate welfare, capitalism morphed into what we can call "absolute capitalism". The simple free trade between individuals or between nations was replaced by the multinational/transnational corporations (TNCs). Whereby "free trade" in practice became a one-way trade: the rich countries demand free trade for their exports, but in turn impose tariffs on imports from poor countries. Adam Smith would be shocked, as he did not foresee (as Thomas Jefferson did) that free trade works only among equals. Look at our homeland and many fellow Third World nations in Asia, Africa and Latin America, having changed from better-off to worse-off, and down the economic sink hole: the cliche "the rich getting richer, the poor getting poorer" and their "widening gap" are realized and ever growing at a faster rate. And capitalism is not a guarantee for nor the same as democracy (economic and political). But this is another topic. Under Absolute Capitalism aka "Global Neocolonialism/Neoliberalism" the westernized minds of native technocrats in emasculated poor countries such as our homeland rationalize to their mendicant governments, despite protestations by the masses, to agree with the rules of the World Trade Organization (WTO) --enforced and controlled by the consortium of rich countries (G7, excluding Russia) through the International Monetary Fund (IMF) and the World Bank (WB). Both these latter financial institutions supposedly founded to help the poor people of the Third World countries; but as turned out instead, to effectively, subtly and efficiently allow the rich countries to help themselves with the national resources/patrimony of the poor nations. After 75 years, communism's icon Russia collapsed and its formerly, so-called satellite states (Eastern European countries under its sphere of influence and control) consequently spinned off to become capitalists. Despite their role in building the only superpower against the noncommunist superpower America, Russian communists made their society demonstrate that communism in the long-run did not work for the majority of real people, not for human betterment, not for their human dignity and progress. Of course, it still remains to be seen whether the majority of Russians and the citizens of its former satellites will materially progress and maintain their human dignity with capitalism in their embrace. As to the People's Republic of China, it is guardedly becoming capitalists. Its people in the mainland was unified and strengthened by communism; but in the end its ancient beliefs in the Confusian and Buddhist sages and other cultural heritages, and plain Chinese nationalism among them are winning them out slowly but surely and economically liberating themselves from communism. Contrary to the Russians, it appears that the mainland Chinese will also gradually be politically democratic as in Taiwan (formerly Formosa). What more about nationalism? If we think about it, we will see that colonialism was driven by nationalism. European or American colonialism was driven by their own nationalisms: to serve their own national interests, of the needs of their expanding businesses and peoples. So were the Japanese who invaded and occupied China and other Asian nations to satisfy the Japanese need to adequately feed their populace and have raw materials for their industries. As an aside, we can say that WW1 and WW2 can also be seen as wars between colonialists or imperialists. The roots of WW1 were established by various alliances and competing empires, precipitated by the assassination of the Austrian archduke Franz Ferdinand. The end of WW1 deprived and humiliated the Germans via the Treaty of Versailles. WW2 came about partly due to Hitler's use of the nationalist call to unite the Germans and wage war with the WW1 victors and redeem the German national honor lost in the Treaty. The end of WW2 was orchestrated by the USA which remained as the sole economic and military world power. With the upsurge of intense nationalism in their former colonies of colored people/race, the former colonialists and imperial contestants became partners and agreed to create neocolonialism in their former colonies. These European, American and Japanese nationalisms may be properly seen as ultra-nationalism or imperialism; though these same nations mislead others today by labeling the demand for national sovereignty/plain nationalism of a poor nation's homeland as ultranationalism. Since their nationalism goes beyond their national boundary/territory and worse, at the expense of the weaker nations whose market (supply and demand) and patrimony they covet. These imperialists do not hate communism, they hate the nationalism of the poor peoples of the world --who realized and got tired of being screwed for centuries--and thus do everything to divide the poor natives, to prevent and destroy their nationalism. By labeling or equating nationalism as "communism" or "terrorism", they -mainly the US in most instances- justify the use of their superpowered military forces, or through the trained native troops and paramilitary forces of mendicant governments, against nationalist movements. Lastly, communism is not nationalism, though there are and will always be communists who are nationalists and vice versa. Looking at and thinking about the changing histories of nations, I think and believe that nationalism is the best, everlasting sentiment that will carry our fellow countrymen in the homeland to fight and win for decent and dignified livelihood and existence. Nationalism is the better ideology if one wants to label it as one. 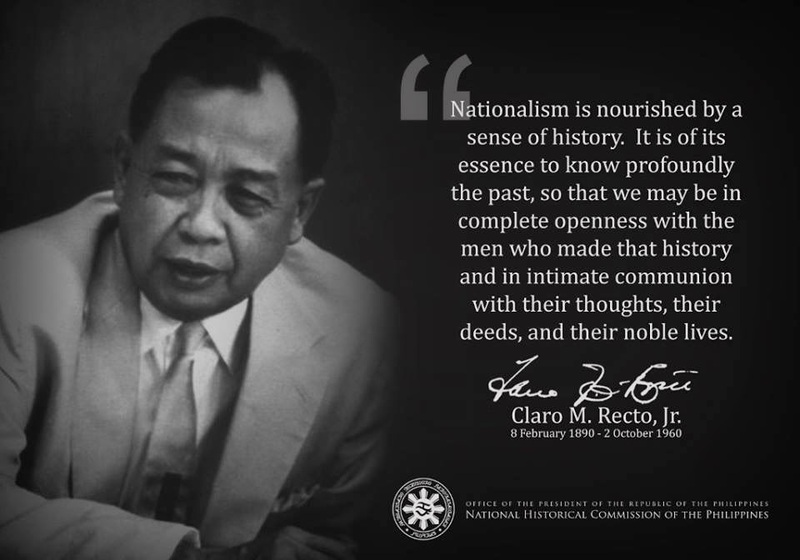 Only after nationalism has become instilled --albeit a very difficult and long process-- in the minds and hearts us Filipinos, especially those of fellow Filipinos-in-the-Philippines, will we become united, be ready to face and deal effectively with the economic, political and military might of the imperialists (communist or anticommunist or other) and their native surrogates. Nationalism is the sine qua non for national unity, economic self-sufficiency, human decency and dignity, and true political independence in our homeland.